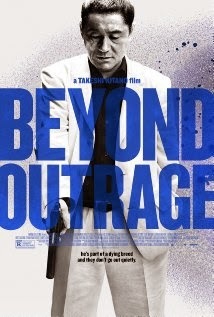 Movie Review: “Beyond Outrage” is the new Japanese yakuza thriller by Takeshi Kitano (considered best director by Asian Film Awards), relying in the same cyclic alliances and betrayals among gangsters and cops. Kitano plays confidently a fearless executioner and old-time yakuza, Otomo, who joins forces with another retired Mafioso called Kimura, right after being released from prison. All this strategy came from the organized-crime detective, Katoaka, whose goal was to gain power by creating a war between the Sanno clan from the East and the Hanabishi clan from the West. Employing dark humor even in the most raging and fiery scenes, “Beyond Outrage” is far less violent than its predecessor “Outrage” from 2009, and showed to be smarter and more appealing in terms of plot. The execution was the weakest aspect of the film, with a couple of questionable camera movements and some awkward shooting scenes that could have been improved to look more reasonable. Even though, the film is entertaining and shows some creativity in a few scenes, particularly a memorable one that depicts a man’s face being smashed by baseball balls thrown by a machine. I’m hoping that the announced third part of this outrage trilogy can follow the lines presented here, but without trying to show off in the shootings, and presenting some more suspense and unusual outcomes. Meanwhile, this second part goes on the right track, and deserves a peep.